John the Baptist drew the people with his message of repentance. They came to John for baptism in the River Jordan; a symbolic action, showing their desire for forgiveness of their sins and a new direction in their lives. So why does Jesus come to be baptised by John? He is without sin, and has no need for repentance or forgiveness. But, by immersing himself in the waters of the Jordan, Jesus shows us that he is fully immersed in our human condition. His baptism symbolises his unconditional ‘Yes’ to his Father’s plan of salvation. Without sin himself, he will share fully in the consequences of sin, all the way to the Cross. 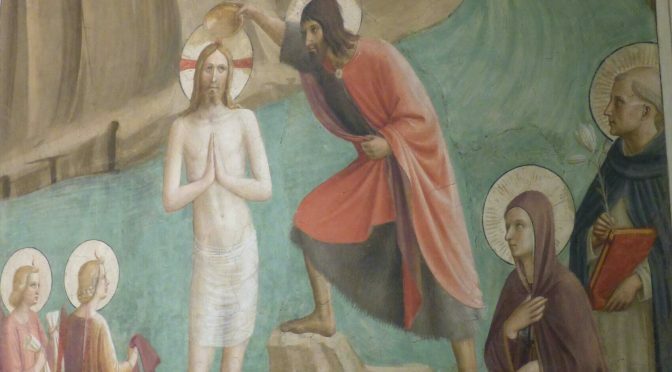 After his baptism, Jesus receives the Holy Spirit and hears words of consolation and encouragement from God the Father: ‘You are my Son, the Beloved.’ In our own baptism, we said ‘Yes’ to God’s plan for us, and we were adopted as God’s children – brothers and sisters of his beloved Son.